How do you want your Aids to Navigation? 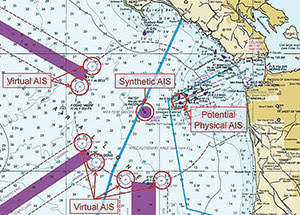 On March 12, 2014 the USCG began operating 25 fully functioning “virtual” and “synthetic” eATONs in San Francisco waters with a goal to improved safety and efficiency. Some of these electronic waterway signposts mark the ship-traffic lanes outside the Golden Gate Bridge. The eATONs are only “visible” to vessels equipped with Automatic Identification System (AIS) technology that’s currently found on large commercial vessels and a small portion of recreational boats. Boaters are encouraged to take the short survey before the end of the year.